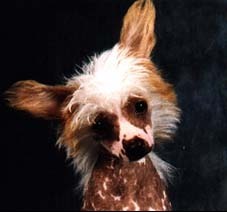 Chinese Crested dogs are unlike any other breed. Because of the breeds body temperature being higher than other breeds, their skins always feel warm. Chinese Crested dogs are small, elegant and very cuddly. They are also intelligent and very faithful. They are described as a small and funny companion. Because of their playful and gentleness, they are perfect for families and with children. They are suitable for apartments. The lack of hair renders them suitable for those that are allergic to animal hair. This also applies to those that are affected by animal hair in clothing, furniture and carpets. These dogs are of above average intelligence and they have an endless ability to provide affection. They are very genial dogs. It is a misconception that these dogs are fragile and disease prone. On the contrary they are tough ,robust, energetic and seldom ill. Their skins are strong and even at temperatures below freezing point there is no requirement for special clothing unless taken for a walk.